← I Want A Whole Lotta Adam…! I have to say, even overlooking the fact that the idea of marriage kind of makes me light headed, I am really not as thrilled about the direction of the Gay Rights Movement in America as I think a lot of people are. Getting legally married is the least of my concerns when I think about the fact that I can legally be fired from a job in Virginia because of my sexuality, or that my representative in the House, Minority Whip Eric Cantor, voted AGAINST the Matthew Shepard Hate Crimes Act. Cantor, and his conservative colleagues say they are against hate crimes legislation because it assumes the mental state of the criminal and punishes that person more harshly based on that assumption alone. They say a criminal is just a criminal and a crime is just a crime. Wow, cool idea guys. Sounds like you think punishing all crimes should be based only on the result of the crime and not the motive. Sounds like accidental death should really always be homicide, and any kind of crime based in negligence is really better tried with equal scrutiny as crimes with clear malicious motive. Furthermore, there is ALREADY HATE CRIMES LEGISLATION IN OUR FEDERAL LAW! All this act would do is extend the definition of hate crimes to include sexual orientation and gender identity as protected classes. If it’s the hate crime legislation you don’t like, write legislation to remove all hate crime classifications from our legal system. See how that goes when you run for re-election and need the Black vote or the Hispanic vote or the Catholics…or the JEWS. This is not about how these legislators feel about the definition of hate crimes, this is about the kinds of voters they represent in their home districts and the types of attitudes they believe will get them re-elected. That’s Eric Cantor on the right there, a good Jewish boy from the south. Richmond Jews, we ARE gems. I only bring up the Jewish thing because it so happens, religion is a protected class under the CURRENT hate crimes legislation that is the law in our country. And I only bring that up to help illustrate why Cantor’s position on the Matthew Shepard Act, shared by most if not all of the dissenting votes, is really a cover for simple bigotry and discrimination. If they tried to remove Jews from protection under hate crimes legislation, I am sure he would have a problem with that. I WOULD TOO! Selling your soul to pander to your voters is one thing. Wanna know what’s really out of line? Standing up on a national stage and explaining that the death of Matthew Shepard was a simple robbery, without any causal relationship existing between his sexuality and the severity and motive of the vicious murder. Check out what Rep. Virginia Foxx (R-NC) had to say about Matthew Shepard. Rachel Maddow hit the nail on the head in her intro to the video clip and interview with Mrs. Shepard. … crimes like that are intended not only to hurt or murder an individual, but to terrorize an entire community. And so there is a national interest in ensuring that those crimes are solved and prosecuted. Hate crimes have their own investigation unit within the FBI. Click Here for national statistics about the instance and motivation of hate crimes. Race is the first motivation, then religion with Jews being the number 1 religious target, then sexual orientation. Sexual minorities are the 3rd most likely group in the country to be victim of a hate crime, yet they are not a protected class under current federal definitions, and shouldn’t be according to 175 elected members of the House of Representatives. My very own representative, Eric Cantor, a good Jew protected under the current legislation, voted to keep sexual minorities out from under the umbrella of federal protection. I just got off the phone with Cantor’s Hill office. I spoke with a nice staffer named Chris. I asked a simple question. What was the reasoning behind Rep. Cantor’s vote against the Matthew Shepard Act? Chris put me on hold while he “looked for someone who could answer the question for me,” because he didn’t know. He got back on the phone a minute or two later with some disappointing news. There was nobody in the office who could help answer my question at that time. Chris took down my name and address and said they’d get back to me. Before he hung up, I made him take down my phone number and assure me that someone from the office would call me with an answer. I’ll give him a call back tomorrow just to check in on the progress. I get that marriage equality is the country’s way of saying I can love anyone I want and be recognized legally for that relationship. I think that is awesome and I am SO excited about the progress on that front. A lot of hard work has gone into bringing equality to marriage law and I am profoundly appreciative of that work. Talking about love is easy and accessible. It is a whole lot easier to churn up broad national support for campaigns that promote love, partnership, and happiness than national campaigns talking about the victims of hate crimes. The thing about hate crimes that is so important to get, is that the crime not only directly impacts the individual victim, but makes a victim out of every individual who fits into the same category that was the target of the violent hate. When I hear about things like the recent attack against gay men at UVA, you better believe it changes my level of comfort when I head back to visit. What about the first year guy who just pledged a frat and is scared to come out? How does that one hate crime impact his freedom and self-expression? How did these hate crimes impact the LGBT people in their respective communities? 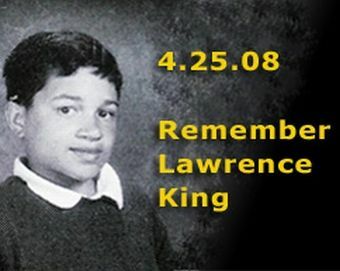 Like Lawrence ‘Larry’ King, killed at the age of 15 just weeks after publicly coming out as gay in his California Junior High. Or 25 year old, Ryan Kieth Skipper who was stabbed about 20 times by two men because they say he was hitting on them. Making the Gay Rights Movement about love and happiness is a great way to gain public appeal before demanding that our lives be valued equally, not just our relationships. In all reality, my relationship is only as equal and free as the people who are a part of it. I hope injustices like hate crimes and the truly heinous laws that discriminate against LGBT people in employment, housing, visiting rights, inheritance rights, and many other areas are not being forgotten or overlooked because we are gaining momentum in the fight for legally recognized relationships. The Matthew Shepard Hate Crimes Act has to pass through the Senate before we can call it an actual victory. Call your Senator and make sure they are voting YES to pass it! Also, feel free to call Rep. Eric Cantor at (202) 225-2815. Check to see if your representative was one of the 175 who voted against the Act and call them to find out why. Be responsible and make sure your voice is heard! I’ll let you know what Eric Cantor’s office says when they get back to me. This entry was posted in Gay, Politics and tagged Equality, Eric Cantor, LGBT Rights, Matthew Shepard, Rachel Maddow, Virginia Foxx. Bookmark the permalink. Very well expressed. You are a light and an inspiration. Keep writing, keep calling. Keep being. Peace. i am very glad to see your post on marriage. it was a nice way to recognize the symbolic value that it holds for many while challenging the movement that has made this the gold standard. well done. let’s keep holding HRC and the like accountable. impressed that you are embracing the issues. you are a force! So, a murderer needs two life sentences now or two death penalties? Not sure of the necessity of it. Seems a bit redundant don’t you think? If Eric Cantor were killed because of his religion, his killer would (hopefully) get punished with a life sentence, or death penalty. Not sure what “protections” you are speaking of? Getting two life sentences instead of one doesnt exactly disincentivize the killer. Please explain the necessity of a new law when there is already law on the books that punishes people in the severest of ways. I look forward to your response. The hate crimes classification allows federal resources to be used in the investigation and prosecution of certain crimes that are deemed an assault against an entire community as opposed to simply a crime against one person. In committing a crime against a community the the criminal is essentially terrorizing all those who identify as members of that community. This act of terrorism is serious and does harm in such a way as to limit the freedom and self expression of members of that community by using fear tactics involving violence. Unfortunately, in too many cases of crimes like this the regional communities in which these crimes are committed are not capable of investigating and prosecuting these crimes without bias against the community that was targeted. In small rural areas with heavy religious influences for example, even the members of the police department there might have personal biases against LGBT people that prevent them from investigating and prosecuting crimes of this nature as completely as necessary. The hate crimes legislation allows the federal law enforcement agencies to step in in cases such as these to make sure that all the criminal actors are prosecuted justly and to rebuild a safe environment for the community that was a target of a hate crime. As an example, if you lived in a town where religious institutions were instructing their congregations that all people named Josh were sinners and were going to hell, and then someone in your town beat up your friend named Josh just because that was his name, I imagine it would impact your ability to live freely as a man named Josh in that particular town. Imagine then you went to the police and they told you to just change your name because that would solve the problem. In cases like these outside actors are needed to guaruntee justice. This is why hate crimes legislation is necessary. The objective is not to punish the criminal twice for the same crime. The primary objective is about correcting situaions in which the local law enforcement is too biased or too small or for any number of reasons incapable of investigating and prosectuing the crime adequately enough to ensure the safety and freedom of all members of the target community. Thanks for your question! This is a great point to further clarify. Silly Republicans, My Brother Is Coming for You!